There is a lot of information on this one board to take in. It takes a while for you to find what you want to do. 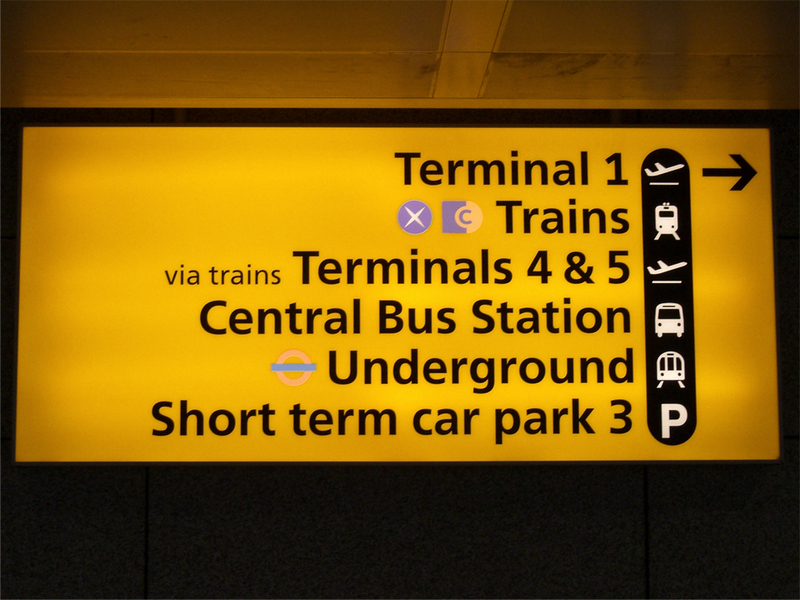 It makes no sense for the terminal and transport lines to be separated from each other, better to have relevant information next to each other. Maybe all the transport options (because they are all in the same direction) could be placed under one title such as – “Transport links” with a symbol of a train? I feel the black strip of the symbols takes you eye away from the information, but the symbols themselves are not brilliantly clear, so don’t work individually. The text and symbols look like separate objects and do not compliment each other as they should. Mainly due to the black strip. Generally the signs look cheap! Why has lost property been squashed in at the bottom? Was this not considered as an original option? 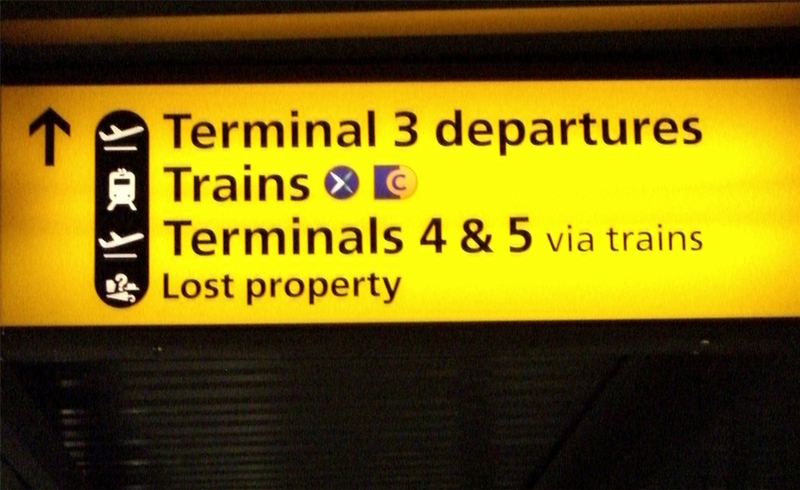 Also, on some signs the lost property symbols is replaced by a security symbol, which makes no sense to me what-so-ever. When you are standing here, the pillars surround the “smoking area”, on each side of the pillar it says “no smoking” I just don’t understand what area isn’t allowed to be smoked in, unless you just cannot smoke next to a pillar? 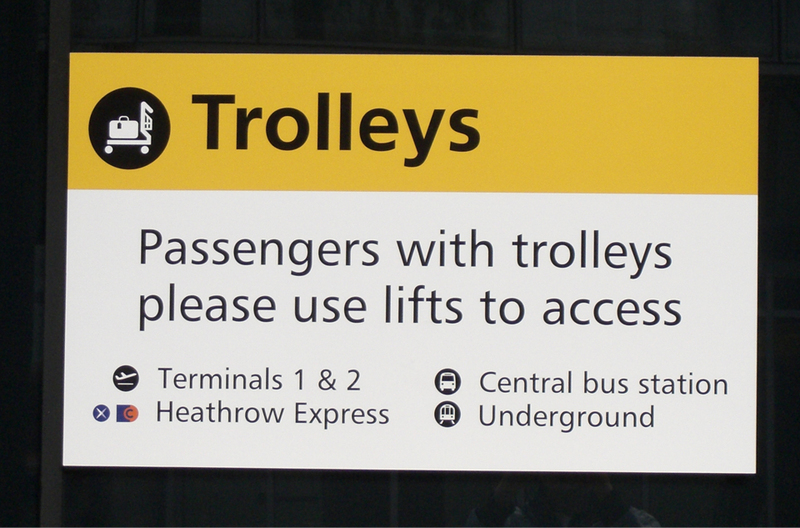 This sign I thought was an improvement on the rest, the one issue I have with it is the fact that the areas you can access via the lifts are much smaller than I feel they should be. 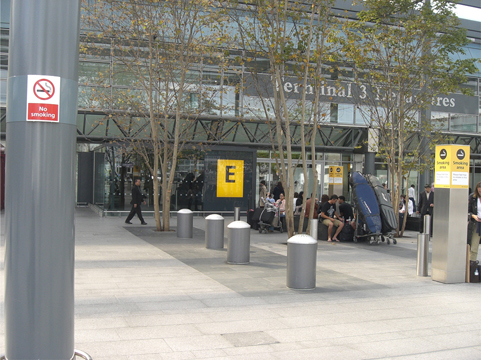 The sign could be extended and allow for larger information to appear. Last of all, this sign. I don’t have much to say about this except that most other signs are using the Sans serif typeface, with the occasional serif exception such as this. I don’t understand why this is the case, it just seems like more effort in the design process to pick another font that is not needed.